From 2013 to 2015, it was estimated around 54.4 million US adults annually were diagnosed with some type of arthritis, rheumatoid arthritis, or other painful conditions such as gout, lupus, or fibromyalgia. It can be frustrating to live with the chronic pain of these ailments if you love gardening. However, you don’t have to give up your green thumb due to these ailments. With tools such as foam kneelers and benches, you can keep doing what you love with minimal pain. These items can also help aging seniors assess household tasks that may require getting down low to reach areas. Here are several items that can help you continue to be comfortable in your garden and around the home. We love this versatile bench/kneeling pad for its thick padding, add-on tool pouch, and the option to be used as a bench or pad with handles to help you up. The SONGMICS Garden Kneeler with Pouch is ideal for those who want a little assistance getting up and down while gardening. It has side handrails on both ends of the seat to make getting up and down easier with sturdy support. It’s also foldable for convenient storage and carrying. We like that this kneeler has a soft cushion that reduces pressure and fatigue on both your knees and lower back. The low-to-the-ground design helps to protect your clothes from soil and getting grass stained. Another big positive comes in the form of the versatile design.The device can be flipped over as a kneeler or flipped over the opposite way to be used as a bench. In either position, the kneeler features a side-pocket pouch for holding gardening tools. This bench/kneeler offers a seat option as well as a pad with handles to assist you up with twopocket pouches. 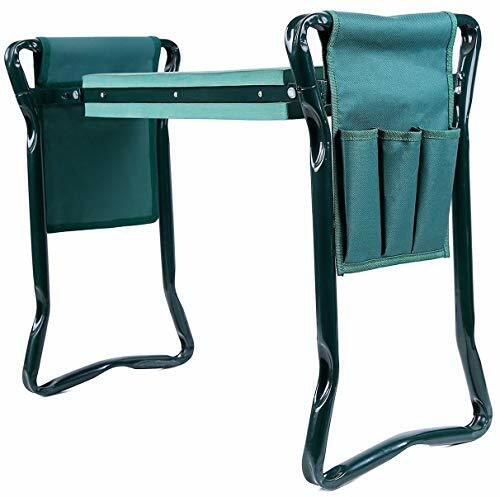 The Ohuhu Garden Kneeler and Seat is similar to the SONGMICS kneeler, but for just a few dollars more, comes with two tool pouches. Each pouch comes with lined bags, which can be a benefit to users who need to carry items and tools. We love the multi-function bench and kneeler options, and the handles to help you stand back up when used as a kneeling pad. The design is also very lightweight and simple to fold down and snap in place. The bench is very comfortable, and if you garden regularly with a partner, spouse, or friend, is also available in a two-pack. This is a perfect product for those who need dense, thick foam in particular for kneeling projects in the garden or indoors. The RED Home Club Thick Kneeling Pad has outstanding ratings, with 80 percent of well over 1,000 reviews brining in five-stars. We tried it out and can see why. It’s incredibly lightweight, yet has an extra thick pad for comfort while gardening, kneeling for chores like floor scrubbing, or even fixing lower spots, such as flooring vents or door handles. The affordable price is fantastic, as well. This multi-use pad is easy to store and comes in blue, black, and green. If you are exceptionally small or have severe knee issues, you may want to be aware of the firm padding, as it can be hard on someone who has had recent knee issues or surgery. Best foam kneeler for those who need a less dense foam kneeler and just need a little cushion for gardening or projects where you have to get down low. 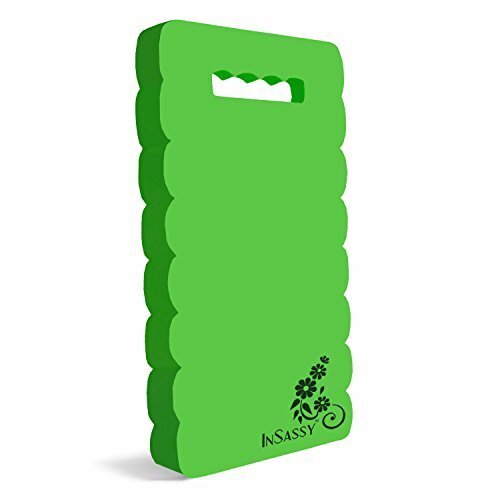 The InSassy Garden Kneeler Pad Kneeling Mat is perfect for those who want various color and size options in a basic foam kneeler. The pad comes in blue, green, orange, pink, and purple. This kneeling pad is a little thinner than the RED Home Club option, so if you have tried that kneeler and found it too hard on your knees, this is an excellent option to try out. This kneeling pad also allows customers the option of size, accommodating those who made need a larger surface to feel comfortable in their garden. Just like many other knee pads on the market, this can be used in both the garden and inside for chores or even in the garage for kneeling car repairs. Our favorite for the no-frills, high-quality design and two-layer foam with varying density. Pick the cushion side that works best for you! COMFORTABLE SIZE - exact dimensions of this knee saver are 16.8" x 12.9" x 1". Designed to suit anyone of any age and of any size. The Navy Penguin Kneeling Pad is unmatched in high and five-star ratings. One of the most exceptional perks of this kneeling pad is the two-density foam layers, balancing the cushion from being too hard or too flimsy. This is like the ‘Goldilocks’ of foam kneelers, as you can flip it to the side that is just right for you. We love this kneeler for its straightforward construction. The foam really is comfortable. The measurements are big enough for a person of average or larger size, but portable enough to store with ease. 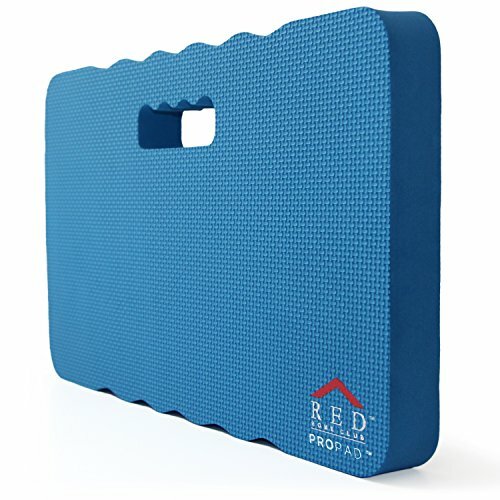 Ideal for gardens, indoor use, garages, this kneeling pad is worth the few extra dollars, if you’re looking fora quality foam pad to protect your joints. To avoid extra pain while doing activities such as landscaping, you must consider your particular body type, level of joint discomfort, and how often you will use a foam kneepad. Symptomatic osteoarthritis specifically in knees occurs in roughly 10 percent of men and 13 percent in women of the age 60 years and older. To avoid extra pain while doing activities such as the landscaping, you must consider your particular body type, level of joint discomfort, and how often you will use a foam knee pad. If you are a larger individual, look for foam with more density and figure measurements such as the RED Home Club model. Conversely, if you are particularly petite and have severe arthritis in your knees, you might need a much softer cushion. Something like the Navy Penguin dual-density foam pad or the InSassy Garden Kneeler could be good options for your case. Do You Need Assistance Getting Up? You also want to consider whether or not having handles on a kneeling bench/pad would be a benefit to you. If you labor in getting up and down, you don’t want to find yourself stuck out in the garden if a sudden downpour starts or an emergency requires you to get up quickly. Moreover, you don’t want to fall if you feel weak while trying to get up on your own. You may find it worth your while to invest a little extra money into a kneeling pad if you garden on a regular basis. A model such as the SONGMICS kneeler that can be flipped over as a new pad with handles to help you out would be just what you need. With the bench type of models, sturdy bars and secure lock-in-place construction is essential for safety as well. You don’t want to attempt to apply your body weight to a handle that is not locked in place, which could result in injury. Look into reviews, especially if they number in the several hundred or even thousands. However, remember to take some negative reviews with a grain of salt. Occasionally, devices are not used correctly, or instructions are not read thoroughly. So, if the overwhelming ratio of ratings is four or five stars, you can bet it is likely a quality product. 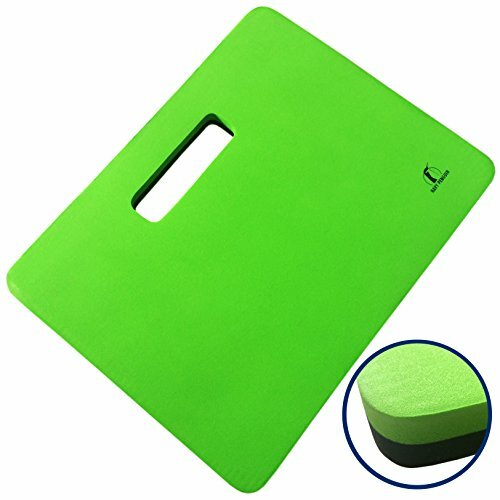 If you do purchase something such as a bench/kneeler but feel like the cushion is not soft or thick enough, remember you can always pick up another inexpensive foam pad to add to the softness or thickness of foam. Doubling up foam pads can be a smart idea if you need a lot of padding for your joints. Just make sure the foam is not wet and therefore slippery between two kneeling mats. You can also discuss with your physician what type of kneeling pad would be best if you have a severe case of an ailment such as arthritis. When outside gardening, if there’s any risk of getting stuck or needing help out, try to keep a mobile phone with you at all times in case of emergency. 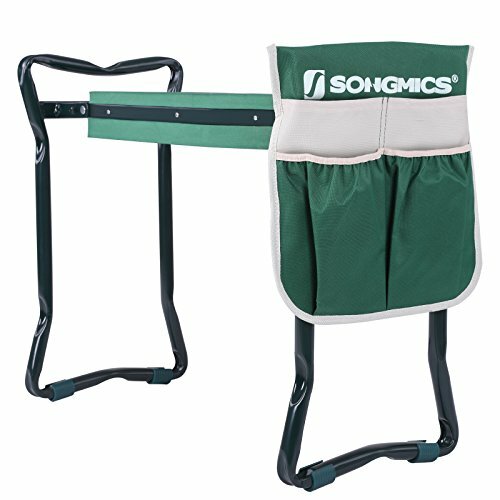 If you don’t need to talk to a doctor, and just want an excellent overall kneeling pad/bench for gardening or other activities, we recommend the SONGMICS model. Its versatility, bonus tool pouch, and foldable legs for storage make it one of our favorites.